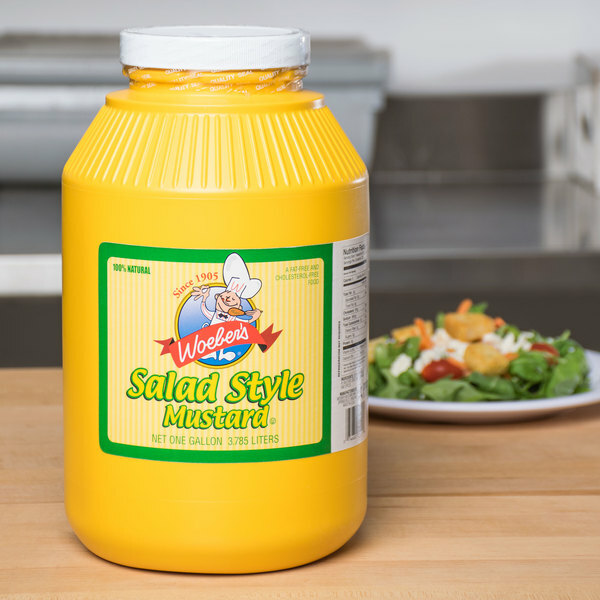 Woeber's 1 gallon yellow mustard is perfect for hot dogs and hamburgers! This blend has a classic appearance and smooth texture. In addition to the mustard seeds, this mustard features turmeric to give it the bright yellow color it's known for. 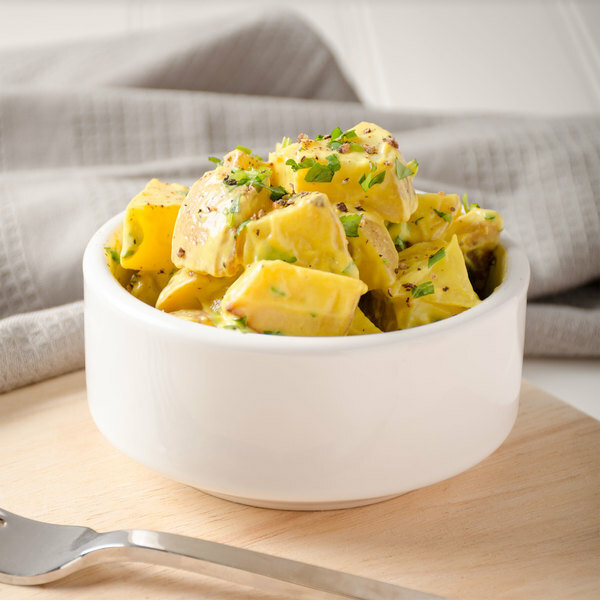 This salad style, yellow mustard has a traditional taste that your customers know and love. Try it on soft pretzels, or with salad dressings and sauces. It will instantly add flavor to your sandwiches, deli meats, and even hors d'oeuvres. Perfect for any occasion, the zesty taste is sure to please! One of the most popular condiments, this yellow mustard will add just the right amount of bold flavor to your entrees and snacks. Not only does this American-made Woeber's mustard taste great, but the bulk gallon size is a great value, too! Since yellow mustard is a must-have, it's good to stock up for your sandwich shop, restaurant, catered event, concession stand, or deli. Sooooo good. Versatile as well. Besides being an awesome add to sandwiches or veggie burgers, I also use this in deviled eggs. I'll never use another mustard but this! YUM! Great item, very reasonably priced. I would recommend for any other business owners to compare what they pay for food to this site as many of the products are a lot cheaper in costs on here! I use this in my Southern Style SC Yellow Sauce and the customers love it. 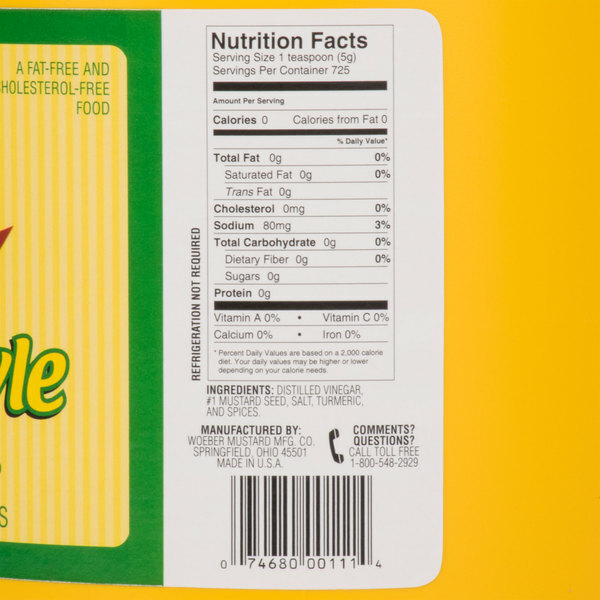 It has that true yellow mustard "bite" that is needed for authentic South Caroline Low Country style vinegar and mustard BBQ sauce. HIGHLY recommend. I hosted a hot dog eating contest on Independence Day for charity. I needed to keep costs as low as possible and this was a great find. It tasted great and just as good as any store brand. Good mustard. Great price. The plastic jugs are way easier to store and transport than the cans or jars. Has a great taste and quality mustard. The Woeber's gallon yellow mustard is unbeatable. The price is great for our school concession stand the taste is so similar to big name brands. 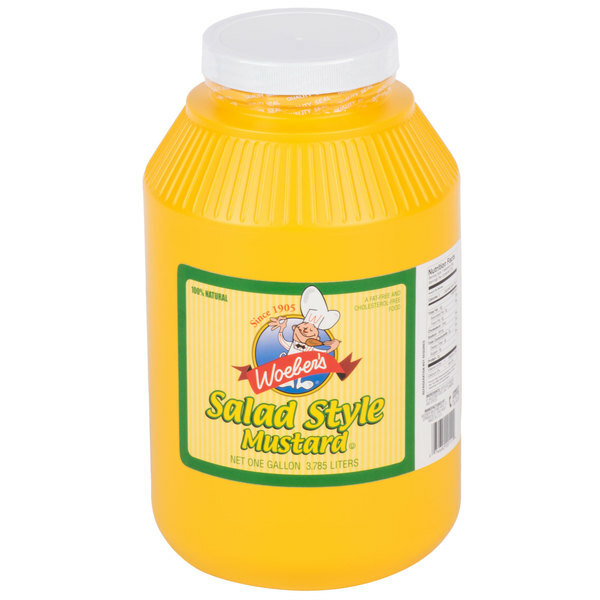 Convenient, gallon sized jars- we use this to make our house honey mustard dressing. The price is great, as is the product. We use quite a bit of our house honey mustard, so we always have a few gallons in hand! 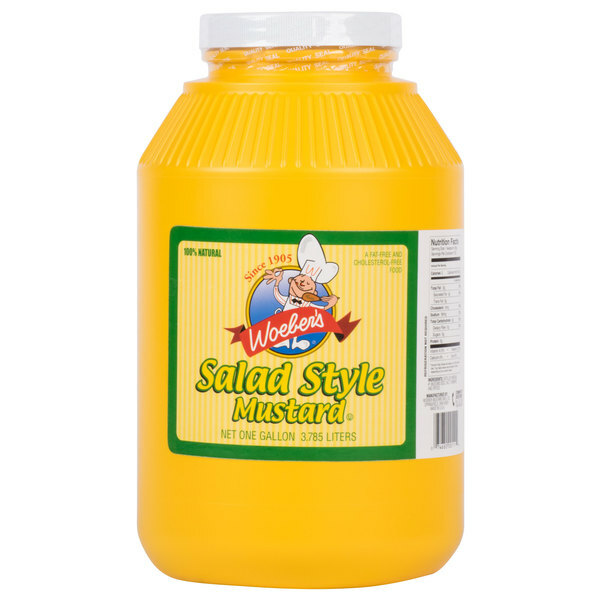 The Woeber's 1 Gallon Yellow Mustard is an excellent tasting mustard that is cost effective. My customers love it. I would highly recommend this for any kitchen. A nice large size yellow mustard that is so delicious. The mustard is perfect for adding to potato salad and making a great mustard BBQ sauce. A great yellow mustard from Woeber's that is tasty. A great mustard for our hot dog cart and fits into our dispenser perfectly. The best quality yellow mustard for the price.